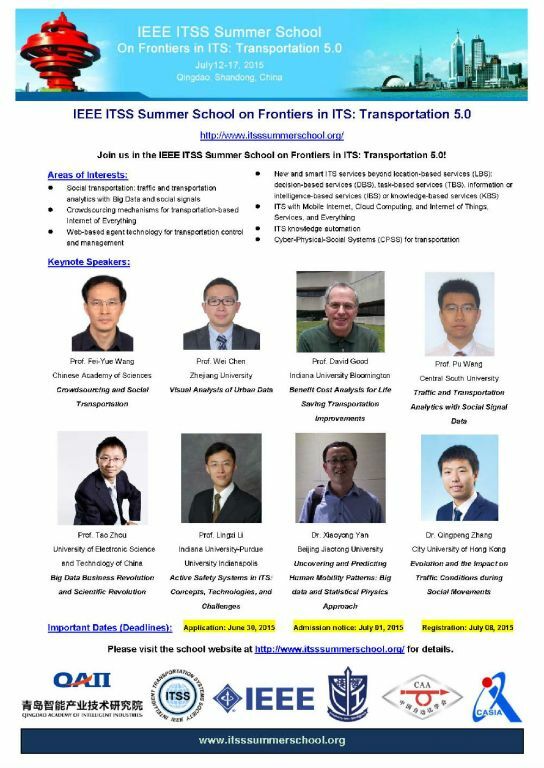 Join us in the IEEE ITSS Summer School on Frontiers in ITS: Transportation 5.0 ! Abstract: Current ITS projects are still too much field or discipline centric, traffic, vehicular, infrastructural, computers, control, communication, web, services, and so on, issues and problems are addressed mostly independently, sometimes integrated only at the small-scale or local levels. To many total integration in physical space is something of an impossible mission: a hopeful journal to nowhere due to various forbidding economic, legal, ethical, or scientific barricades on the road. This is true to a large degree, but now, Cyberspace offers us a new mechanism of overcoming these barricades and an augmented reality infrastructure of integrating technology, systems, and societies for transformation in transportation and mobility. Total integration in cyberspace still faces many hurdles, but much less daunting, and should be feasible for implementation with models for artificial or software-defined transportation systems, methods for computational experiments, and tools for parallel execution of actual and virtual operations and organizations. I believe that this will be the future for ITS and for future transportation and mobility research, development, and applications. Abstract: Data-driven intelligent transportation systems utilize data resources generated within intelligent systems to improve the performance of transportation systems and provide convenient and reliable services. Urban data refers to datasets generated and collected on urban life. Data visualization is an efficient means to represent distributions and structures of datasets and reveal hidden patterns in the data. This talk introduces the basic concept and pipeline of urban data visualization, provides an overview of related data processing techniques; and elaborates on existing methods for depicting the temporal, spatial and numerical,categorical properties of urban data. Abstract: With the fast development of electronic and sensing techniques, individual portable devices such as smart phones have experienced rapid growth and generated huge volumes of social signals. Social signals, from GPS coordinates generated by taxis to mobile phone billing records and messages on the social networking, record our daily spatiotemporal information and create large amounts of data for traffic and transportation analysis. Social signal data, which record various aspects of human behaviors, are characterized by big volume, wide spatial coverage, long observational periods, and real-time features. The emergence of large-scale social signal data promotes our understanding of human mobility and offers researchers unprecedented opportunities to analyze traffic and transportation. In this lecture, I will introduce a few works on the applications of social signal data in traffic and transportation analytics and summarize the features, analytical approaches and applications of commonly used social signal data. Abstract:The World Health Organization estimates that globally in 2012, 1.2 million people were killed in traffic crashes annually. Fatality rates are particularly high in the developing world (India, Brazil and Africa). As vehicles become more commonplace in these countries, it will be important to press for a wide variety in improvements in the infrastructure and vehicle design to prevent this tragedy from becoming still worse. These transportation improvements lead to a wide variety of outcomes, often conflicting with one another. In some cases those outcomes are relatively easy to quantify (for example reduced expenditures on fuel). In other cases they are much more difficult to value (for example improved air quality, or a reduction in morbidity and mortality). In this talk, some of the valuation methods used to evaluate safety, such as fatalities, injuries, reduced life-years for victims and reductions in the quality of life for those who are not killed will be discussed, often raising moral dilemmas. Applications include active safety systems in vehicles, passive safety systems in vehicles and regulatory analysis. Differences in the approaches use, for example regulatory analysis in different parts of the world are also discussed. Abstract: How to improve driving safety is one of the most important aspects for intelligent transportation systems. Traditional passive safety systems (e.g., seat belts, airbags, etc.) take effects to prevent potential losses after crashes occurred. In recent years,vehicle active safety systems have been playing an important role in driving safety. These systems are in general based on advanced sensing/communication/control technologies, and are able to identify and predict potential crash/near-crash events and take appropriate actions to mitigate crash effects or even completely prevent potential crashes. Many active safety products have been equipped in vehicles, including pre-collision systems, crash imminent braking systems, pedestrian/bicyclist detection systems, etc. In the lecture, I will introduce basic concepts of active safety systems and present several works on their design and performance evaluation, along with some challenges. Abstract: Understanding and predicting human mobility patterns are of importance for exploring many complex systems affected by human activities and have many practical applications in transportation planning, traffic management, location-based service and so on. The increasing availability of big data from mobile phones, on-board GPS devices and location-based apps has triggered a revolution in the research of human mobility patterns. In this lecture I will talk about how to extract and uncover individual and population patterns of human mobility from mobile phone data, taxi GPS data and social media check-ins data. I will also introduce some of our new proposed statistical physics models of predicting human mobility patterns, including a maximum entropy model to explain the scaling law in travel distance distributions and predict extreme events in human mobility, and a population-weighted opportunity model to predict crowd mobility patterns in cities. Abstract: During the past decade, social movements and other social unrest related movements have become increasingly prevalent all over the world. Social media has been playing an important role in organizing and disseminating information during almost all recent social movements, in both West and East. In this talk, we will first go through the basics about social media analytics, and then use one case study to exemplify the research methodologies. The speaker will present his research aiming to characterize the evolution of topics discussed on Twitter, and to identify the impact on the traffic conditions during a social movement happened in Hong Kong - Occupy Central Movement (OCM) in 2014. The results indicate that (a) Twitter has been mainly used as a tool to publicize and disseminate information, instead of organizing the movement; (b) the effect on the traffic speed of main routes in Hong Kong was not significant. We also discuss the practical implications of our observations. Abstract: Future travel-time information is one of the most critical factors that travelers consider before making trip decisions. It enables optimal route choices of drivers and mitigates congestion by distributing traffic demands. However, traffic state prediction is a challenging research subject involving prediction reliability. In order to effectively support various transportation strategies and applications including Intelligent Transportation Systems (ITS), it is necessary to apply appropriate forecasting methods for matching circumstances in a timely manner. This lecture provides a comprehensive review on modern techniques related to travel-time and traffic condition predictions that are based on “data-driven” approaches and “model-driven. In data-driven approach, different approaches are categorized as parametric (linear regression & time-series) and nonparametric approaches (artificial intelligence and pattern searching) based on the underlying mechanisms and theoretical principles. Then, the approaches are analysed for their strengths, potential weaknesses, and performances from four main perspectives that are prediction range, accuracy, efficiency, applicability, and robustness. The model-based approaches consider underlying traffic mechanisms and behaviors in developing the prediction procedures and they are logically intuitive unlike data-driven approaches that often lead to prolonged computations that are typically not fit for on-line applications. This lecture reviews model-based travel-time prediction approaches by classifying them into four categories according to the level of details involved in the model: Macroscopic, Mesoscopic, CA-based, and Microscopic. Then each method is evaluated from five main perspectives: Prediction range, Accuracy, Efficiency, Applicability, and Robustness. Finally, this paper concludes with evaluations of model-based approaches in general and discusses them in relation to data-driven approaches along with future research directions. More speakers and lectures information keeps updating. The school is primarily intended for students and young researchers interested in CPSS-based Transportation 5.0, but we will take applications from others who are interested as well. We look forward to seeing you in Qingdao! Please visit the school website at http://www.itsssummerschool.org/ for details.